East Anglia has long struggled to bridge the gap between school leavers and higher education. The reasons for this are complex but, as a new network of universities, further education providers and schools is discovering, the region does not lack teenage aspiration. “It’s really inspiring for my art,” she enthuses. 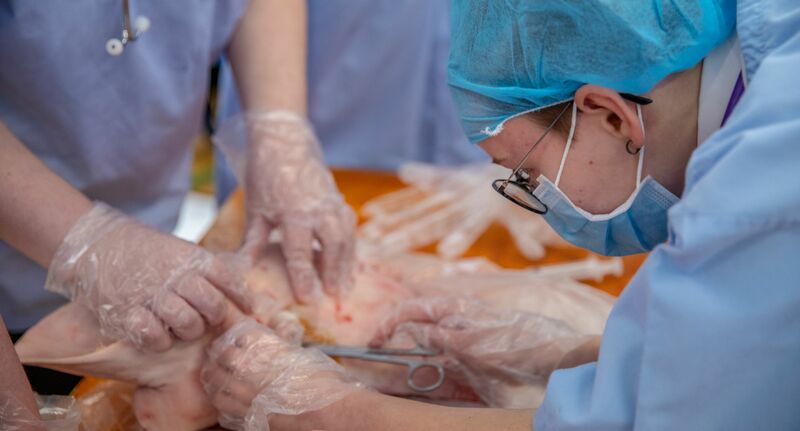 “I often draw half-skulls and half-faces.” Liberty Pinner, a Year 10 student, is one of 60 teenagers from Felixstowe and Ipswich who are taking part in a very hands-on operating theatre experience. neaco participant Liberty Pinner. Photo: Lloyd Mann. Liberty has no intention of entering the medical profession but she does have a plan: “I’m focusing on the creative side – I’m thinking Level 3 BTEC.” Liberty leaves little doubt that she will make this happen, but in doing so she will buck a stubborn trend in her corner of the UK. In 2017, six of the UK’s 50 most severe social mobility ‘coldspots’, identified by the Social Mobility Commission, were in the East of England. While the region’s schools performed relatively well overall, it retained five of the worst performing areas indicated by outcomes for pupils eligible for free school meals. For this reason, the region now commands a quarter of the ‘Opportunity Areas’ receiving UK Department for Education funding to improve educational outcomes – in Fenland and East Cambridgeshire, Ipswich and Norwich. Young woman in the Fens. Courtesy of Andrew Bartram under a CC license. Grades remain a significant obstacle to social mobility in the region but this is not the only challenge. Two years ago, the government identified East Anglia as being one of the least successful parts of the country for converting solid GCSE attainment into participation in higher education. The government has taken this on board, and East Anglia is now home to the largest of 29 consortia in England funded as part of the National Collaborative Outreach Programme (NCOP) to deliver projects tailored to the needs of this specific group of students. For the first time, the region’s five universities and eight of its further education colleges are working together with the common goal of helping young people with little or no experience of university to explore the world of higher education. Launched in January 2017, the Network for East Anglian Collaborative Outreach (neaco) has been working with more than 10,000 students from Years 9 to 13 who live in areas identified by the government as having low rates of progression to higher education. These include urban, rural and coastal areas of deprivation. At the centre of neaco’s approach is a programme of activities under the banner ‘Take Your Place’, which are delivered to students by 30 Higher Education Champions working in over 80 schools and colleges. The programme includes raising aspirations but also improving students’ understanding of, and preparedness for, applying for higher education. The project converts research-based educational principles into a set of core teaching techniques such as challenging students to identify the objective of an activity, encouraging them to use and develop problem-solving strategies and providing ‘scaffolding’ to support progress through difficult tasks. It also draws on the expertise of Dr Sonia Ilie, from Cambridge’s Faculty of Education, who is the project’s lead evaluator. Ilie’s expertise lies in how different aspects of deprivation affect educational outcomes, and much of her work involves assessing the effectiveness of programmes designed to improve the experiences of young people. “In the past, there hasn’t been enough understanding about what works,” says Ilie. “Together with the other NCOP consortia, neaco is leading the way by placing evaluation and evidence building at its heart,” she adds. The Take Your Place activities – Felixstowe Academyʼs eye-removing, lung-inflating event among them – are as diverse as their participants. Earlier in 2018, sixth-formers from Thetford Academy paid a visit to the Norwich office of the insurance company Aviva to gain insights into career prospects. One of the students, Jacek Lipinski, was so impressed that he applied for and secured one of the company’s 16 apprenticeship roles in software engineering. “I was studying computing and programming but I didn’t know what I wanted to do,” says Jacek. A more recent event, organised with the Carers Trust, gave a group of 15- and 16-year-old carers from around Huntingdon an immersive experience of student life at Anglia Ruskin University Cambridge campus. One of the highlights was learning about the marketing of chocolate in the School of Management and, fuelled with samples, the students worked as a team to pitch a new slogan. Back in Felixstowe, the whiff of offal is growing steadily more pungent but the teenage surgeons remain focused on the gory task at hand. For some, the opportunity could not be more relevant to their intended career path. Students dissect a pig&apos;s head. Photo: Lloyd Mann. Jennifer da Silva, a sixth-former at Felixstowe Academy, is in the middle of dissecting a brain but pauses to talk, scalpel in hand. “My mum works in shipping and my dad works at the port,” she says. neaco participant Jennifer da Silva. Photo: Lloyd Mann. In addition to its involvement in neaco, the University of Cambridge plays a central role in Accelerate East, a diverse partnership that seeks to equip young people to participate in East Anglia’s modern high-skills workforce. The University also works with schools through its Area Links Scheme, which enables the Cambridge Colleges to provide advice to schools and colleges across the UK.